De Amerikaanse 'trillion dollar' munt en soeverein geld - Ons Geld | Maak ons geld stabiel, dienstbaar en democratisch. In Amerika lopen de staatsschulden zo ongeveer tegen de wettelijke limiet aan. Ondanks dat die limiet al 75 keer verhoogd is, willen de Republikeinen deze dit keer begrijpelijk niet verhogen. Om onder de gevolgen uit te komen werd gesuggereerd gebruik te maken van een wet die gaat over het recht van de overheid om munten te mogen slaan. Het recht om briefgeld te maken had de overheid al weggegeven aan de Federal Reserve. De wet geeft aan dat de overheid geen munten meer mag slaan uit goud, zilver of koper, maar platina mocht nog wel voor herdenkingsmunten en mooie hebbedingen. Het voorstel was dus door de overheid een schuldenvrije rentevrije munt te laten slaan met een denominatie van een triljoen dollar. Die zou in de kluis worden gelegd van de Federal Reserve, en de Federal Reserve zou een triljoen dollar bijschrijven op de rekening van de staat. Het idee werd geridiculiseerd en afgemaakt. Als er werd doorgegaan met dit plan zou het publiek misschien gaan nadenken over wat geld nou eigenlijk is en waarom de overheid het niet gewoon zelf zou maken. The campaign to circumvent the debt ceiling by having the Treasury mint a trillion dollar platinum coin continues to infiltrate the minds of elite thinkers in Washington. Paul Krugman has come out in favor of it. Congressman Jerry Nadler is in favor of it. Pretty much every major news organization is discussing it. Even Stephen Colbert talked about it last night. As Jonathan Chait at NYMag observes, what’s interesting is that there are very few good arguments, legal or economic, against minting the coin. But contrary to all these people who say that this is a childish, non-adult proposal put forth by impish trolls, it’s actually quite the opposite. It may be the most important fiscal policy debate you’ll ever seen in your lifetime, because it gets right to the nature of what is money. This question is central to any discussion about a country’s monetary and fiscal policy, and yet it’s almost never discussed, and virtually nobody understands it. Almost everyone talking about fiscal policy imagines money to be a commodity of sorts that we can “run out” of if we don’t spend it carefully. In this sense, although we’ve long gotten rid of the gold standard, we’re still shackled with a gold standard mentality, where we think of money as a scarce natural resource that we need to husband carefully, lest one day the bond vigilantes show up at our door, causing us to go broke. But these complaints actually get at the crux of the matter. Creating money is exactly what government does. What’s absurd for a private business is not absurd for the government. As John Maynard Keynes simply put it a long time ago: “Money is the creation of the state.” That the state creates the money we use is actually known to just about everyone, but people have a hard time making the key leap, which is that once the state is in the business of creating money, then the old gold standard notions of monetary scarcity don’t apply in the same way. You can see this flawed thinking all the time. It’s because people think that money is scarce that they think that gigantic government debts and deficits will lead to surging interest rates, because our lenders worry that we might not be good for it. 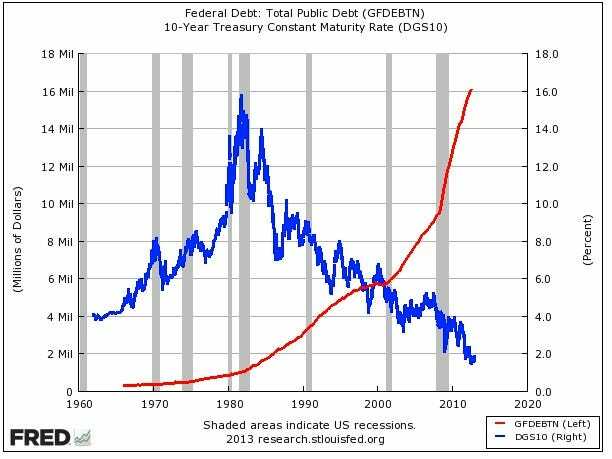 And yet, as this chart shows, as the national debt has surged (red line) the interest that the government pays on the debt (blue line) has gone down. And it’s because people think that money is a finite good (the gold standard mentality) that many people assumed that the Fed “creating money” (by expanding the money supply through quantitative easing) would cause hyperinflation to happen. 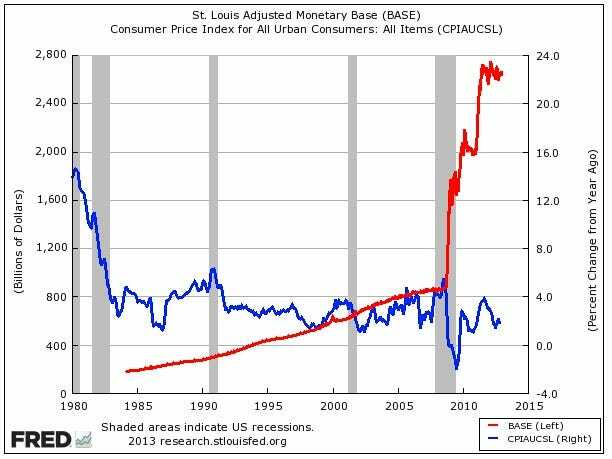 In fact, as the chart shows, the explosion of the money supply (red line) has coincided with muted inflation (blue line). Clearly, economic predictions that were predicted on money being finite have proven to be wrong. This is why the coin debate is so crucial. Whereas most fiscal policy debates talk about what we’re going to do with our money, or why we need to be careful not to run out, the coin gets right to the heart of the matter. Stephanie Kelton, an economics professor at the University of Missouri Kansas City and one of the earliest defenders of the coin, explained via email: Until the idea of minting a $1 trillion coin became a reality, most people probably never gave much thought to the government’s financial operations. We understood that the government spent money, and we knew the money had to come from “somewhere”, but we assumed there were limits to how much the government could afford to spend. Like a household, we were told that the government could spend more than it takes in, but only as long as private lenders remained willing to extend credit. Borrow too much, and your credit rating will suffer. From there, it’s a hop, skip and a jump to “shared sacrifice” and “tough choices” to avoid becoming the next Greece. Cullen Roche, who blogs at Pragmatic Capitalist, and whose blog it was where we first came across the Trillion Dollar Coin idea put it similarly: …the big lesson from all of this is that the coin proves an autonomous govt has no solvency constraint if it so chooses. A prolonged and permanent financing of govt expenditure literally changes the way our system works though. So it’s important to understand the distinction between our current design (which privatizes money to the banking system) and a permanent coin solution which gives the power to the govt. But it still highlights the power of an autonomous govt in its ability to fund its spending. In addition to exploding the myth about government being artificially constrained by an “amount” of money, the debate re-kindles the notion of seigniorage, the process by which governments make money via the creation of money. Philip Diehl, the former head of the US Mint that helped draft the law enabling the platinum coin explained to us via email how funding the government via the creation of money is a history going back thousands of years. What is seigniorage? Seigniorage is the difference between the face value of a coin and its cost of production. Say a quarter costs 11 cents to produce; banks pay 25 cents for the coin and the government books 14 cents in seigniorage. When (more often, if) the coin is returned to the Mint damaged or worn out, the seigniorage is reversed on the books and the coin melted. In this way seigniorage is like an interest-free loan for the life of the coin, and if the coin is never returned to the Mint, it is an interest-free loan in perpetuity. 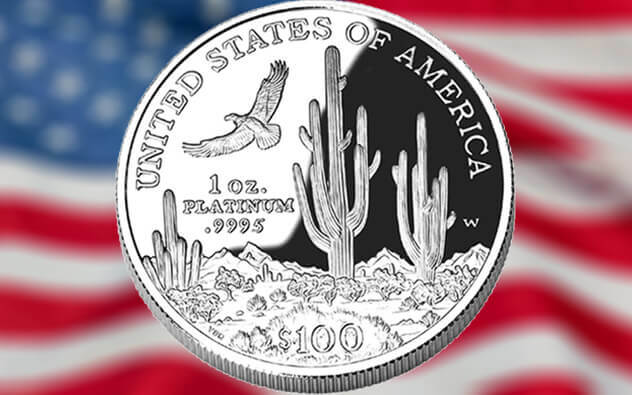 The history of seigniorage dates back more than 2000 years, to the earliest days when governments issued coinage. When precious metals were used, the intrinsic value of the coin was slightly less than the face value, providing a means of financing the government. If the precious metal content were reduced, the currency was said to have been “debased”. If this were done by the Crown, so be it. If it were done by the Mint director, he was hanged. The history of American coinage is more interesting than one might expect. Thomas Jefferson and Alexander Hamilton, otherwise bitter political antagonists, cooperated in creating the nation’s coinage and founding the U.S. Mint. Jefferson had been thinking about an American system of coinage since the days he was writing the Declaration of Independence. He was intent on avoiding the non-decimal systems of Europe in order to simply commercial transactions and democratize the nation’s economy, especially for the illiterate and innumerate. The first Mint was located in Philadelphia in a converted brewery, down the street from the home of the new president. Martha Washington is said to have donated some of the family silverware for the minting of the nation’s first coins. The institution of an American coinage system was a remarkable achievement. At the time, coinage from multiple countries was used in commerce. These competing means of exchange had to be gradually crowded out by the new American coinage and finally demonetized. We might think of this as an early 19th century American version of the introduction of the Euro. In order to have a “serious” debate about fiscal policy, as so many pundits claim to want, we must first understand what money is, and how governments get it. The answer is that they have always created it, and any notion of the government “running out” are illogical. Remember, money is a fiction. Real wealth is capital assets, our infrastructure, our cars, our houses, and most importantly the potential human ingenuity and cooperation. Money is just something that the government creates to facilitate the trade in all of those things. The #MintTheCoin debate, more than any other fiscal debate we can remember, gets right to this matter.